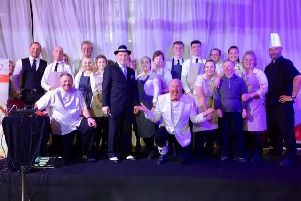 A classic musical about love, loss and pride is brought to life once more by a theatre group which has been performing it for more than 50 years. Lancaster Amateur Dramatic Operatic Society (LADOS) will perform its version of West Side Story at the Lancaster Grand Theatre this week. Based on Shakespeare’s Romeo and Juliet this tragic love story, in the more modern form of West Side Story, can still attract the young people of today. The story follows two gangs battling for control of the turf in the harsh streets of the Upper West Side in New York. The situation becomes complicated when a gang member falls in love with a rival’s sister. Despite its Broadway debut being in 1957, it is still a story as fresh and relevant today as it was then. LADOS first performed the show in 1964 when their leading lady Maria was played by Catherine Margaret Brierley - known as Peggy. Taking the lead of Anita is 18-year-old Ashleigh Hartin. Santiago Acevedo will play Bernardo, Alexander Taylor will play Tony, Catherine Andrews, 19, will play Maria, Matthew Swan, 19, will play Riff and William Patrick will play Action and Officer Krupke. West Side Story runs from Tuesday, May 2 until Saturday, May 6 at the Lancaster Grand from 7.30pm each evening and Saturday 2pm and 7.30pm. Tickets cost £14/£12 on 01524 64695.